I’ve been wanting to share this family recipe with you for a year. In fact, I had taken (lousy) photos and planned to publish this post last summer. But, I had to make the editorial decision to pull it in order to spare you from being blinded by the white light that was glaring off of my potatoes. 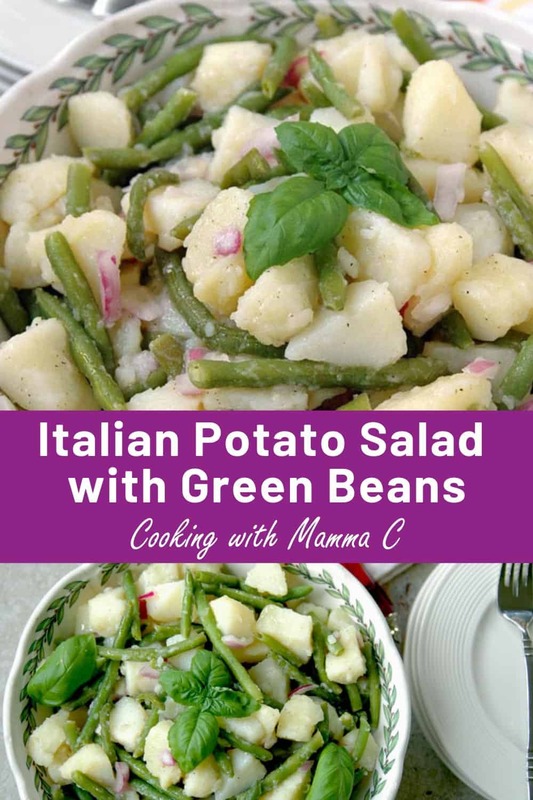 So today, I give you Italian potato salad with green beans, a beloved Neapolitan side dish that has graced every summer buffet of my life. It’s so good, it deserves a spot at your table, even if there’s no party. Unlike American potato salad, there’s no mayo here. 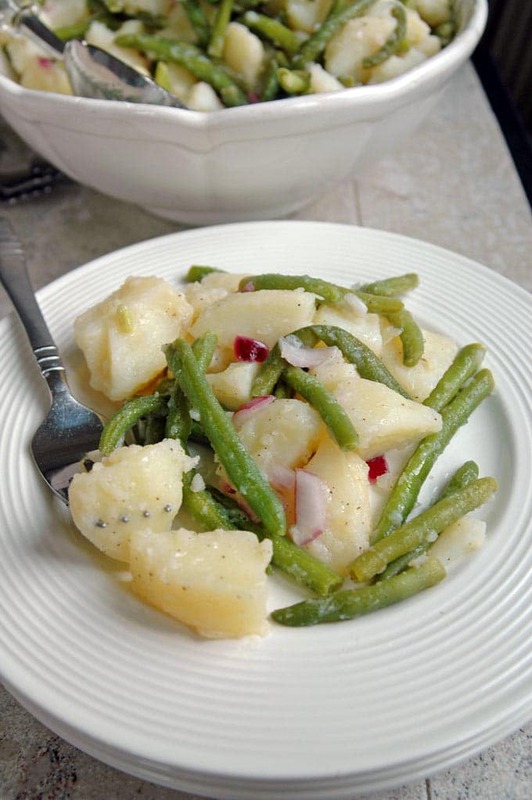 Instead, oil, vinegar and seasonings coat the red skin potatoes, green beans, and red onions, which means this dish holds up very well in the heat and can stay at room temperature for several hours. I always include the red onions in my potato salad, but Mom often makes hers without them. (If you love red onions like I do, don’t skip them!) And, if you can get your hands on fresh basil to add (I bought a small plant at the grocery store), it’ll rock your world. Yum!!! Boil the potatoes with the skins on, and peel them later. Use a slotted spoon to remove cooked potatoes from the pot instead of dumping them in a colander. Remove smaller potatoes from the pot as soon as they are done and let the larger ones cook longer. 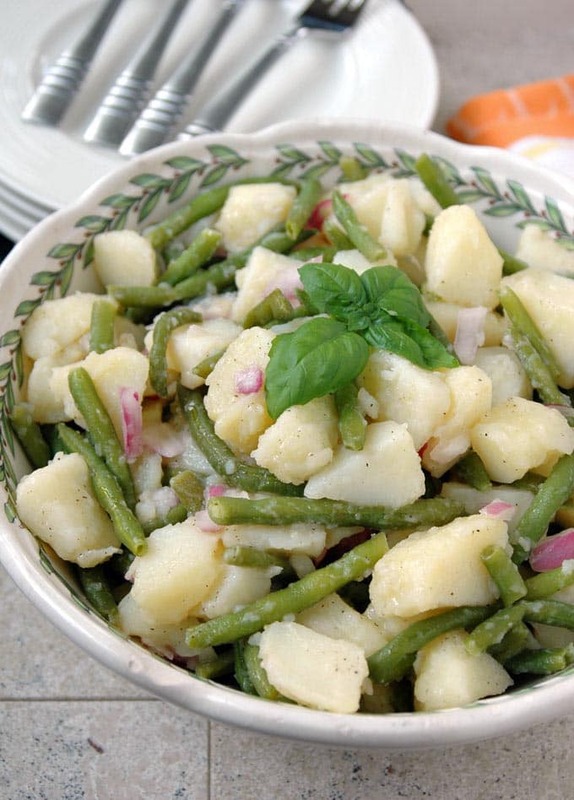 Oil and vinegar dress this delicious Italian Potato Salad with Green Beans, a family favorite. Red onions and fresh basil provide the perfect accents. 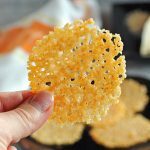 Vegan, gluten free and great for potlucks! Scrub potatoes clean. Leaving the skins on, place the potatoes in a large pot. Fill the pot with enough water so that the water is two inches higher than the potatoes. Add about a teaspoon of salt to the water. Place the pot on the stove over high heat, covered. When the water comes to a boil, lower the heat to a simmer and cover. Cook the potatoes for 20-25 minutes, checking on any smaller ones to see if they are done sooner and need to be removed from the pot with a slotted spoon. The potatoes are done when you can easily insert a fork into the center. While the potatoes are cooking, cook your frozen green beans in the microwave according to the package instructions. (If using fresh green beans, rinse them and snap off the ends. Boil or steam them until they are cooked to your liking.) Drain and toss them with one teaspoon of olive oil and set them aside. Chop up a peeled red onion until you have 1/3 cup. Set it aside. Carefully remove cooked potatoes with a slotted spoon and place them in a single layer on a large platter or sheet pan to cool. When the potatoes are cool enough to handle but still warm, peel them with a small paring knife and discard the skins. Cut the potatoes in half, then cut those pieces in half. If needed, continue cutting the pieces in half until you have chunks that are about 1 1/2 inches long. Place the potatoes in a large serving bowl. Drizzle them with 2 tablespoons of oil and 5 tablespoons of vinegar. Add the red onion, salt, garlic powder and pepper. Gently toss the potatoes with two spoons to mix. Add the green beans to the bowl. Stack a couple basil leaves at a time and roll them up into a cylinder. Slice them up into ribbons and add them to the bowl. Gently toss everything together to mix. Garnish with additional basil, if desired. Serve the potato salad at room temperature. Refrigerate leftovers for up to three days. Brings back memories! Sicilian father taught Polish mother how to make this. The family’s favorite summertime salad. Just made it! Hi Josephine – It’s our favorite too! I’m so glad this brought back memories for you. I can’t have a picnic without this! It’s nice when people who have never heard of this try it and fall in love, and this is almost exactly how I make it! 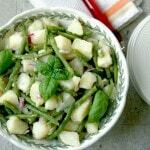 So nice to see string beans and potatoes done the original way, just perfect, great recipe! 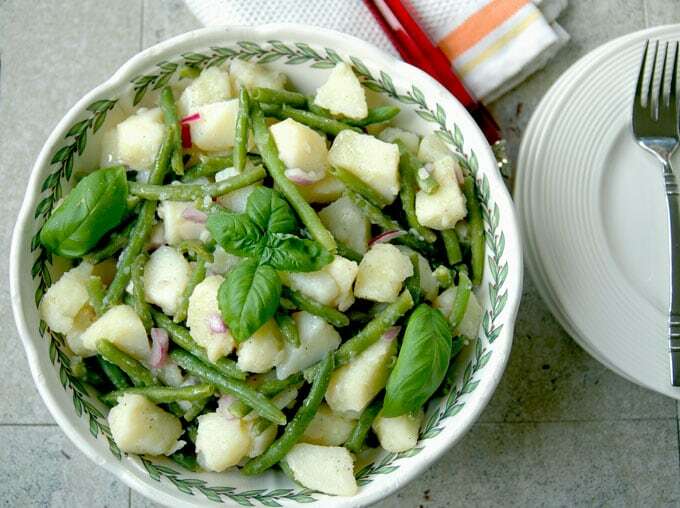 Hi Trish – This is the perfect potato salad for a picnic! I’m so glad to hear you love this too. 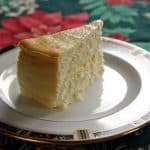 This recipe has brought back so many beautiful childhood memories of Naples. My aunts used to make this salad and my mom used to make it with beets instead of green beans that gave the potatoes a pinkish look. I will make it tonight. Thank you for this memory and recipe. Yes that is the way it’s made in Naples. Hi Rosa – You’re welcome! I’m so glad you shared your memories. Enjoy! Interesting! I was taught to make it with Mint, not Basil. Hmm, I might try Basil, but think I’ll like the Mint better. That is interesting, Toni. I love fresh basil, but I’ll have to try this with mint! These pictures are getting to me! This looks so comforting and homey. 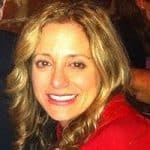 “This is how we do it in Naples,” is a good enough reason for me! haha Great recipe, Andrea. I know it will be on my table! I’m glad this looks appealing! (I think I made a good decision to wait until I had better photos, LOL.) I hope you enjoy this. Thanks, Tammy! I am not normally a potato salad lover, because of that sticky mayo…I just can’t do it! 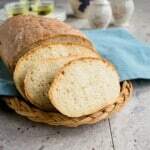 But I love the looks of this one, so light and fresh and healthy! Looks delicious! 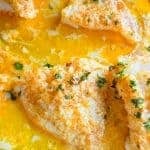 This is definitely lighter and a great way to enjoy potato salad. It’s nice to make some on the weekend and use the leftovers to pack in lunches or to have a nice side dish all ready to go for weeknight meals. Thanks, Denise! I also make this green bean salad. I prefer it to the one with mayo. Sometimes in a pinch I use the can version of both potato an beans. To change it up I sometimes add chick peas to the mix. It is a lighter salad than the one with mayo. The beans would be a great way to add protein! Hahah! You know I love that…”This is how we do it in Naples.” This is one of my favorite sides though I’ve never incorporated red onion. I would love that! Thanks for sharing this awesome recipe with such lovely comforting photos, my friend! Yes, go for the red onion! I’m so honored you like my photos, Annie. That’s a great compliment, coming from one of the most talented ladies I know.